Yesterday evening I was paid a visit by an LX200 weilding friend and some clearish skies. Much time was spent with hammers and spanners making the equatorial wedge servicable and testing the polar alignment. Read more and see the photo. The 10 inch Meade LX200 SCT is larger than I remember. 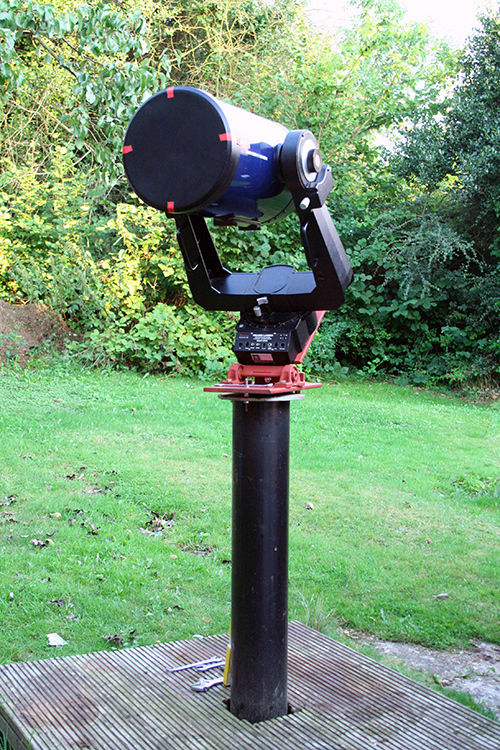 I've not seen this scope for several years - it has been languishing in Pete's shed for some time - the poor thing hasn't seen starlight for a couple of years. It really is quite a big lump of noisy engineering. The rejuvinated wedge was attached the the guest pier (how many of your have a guest pier for visiting telescopes, eh?) and I demonstrated to pete how my modfications to the altitude screw made it a far more solid affair. He was happy to lift up the LX200 and put it on the new wedge, and after some phaff with washers the telescope was very secure. A large improvement over the previous times we had used this wedge and telescope combination. The main purpose of this visit was to establish whether the LX200 would be made to point north. I wasn't too sure if there was enough travel in the azimuth. We weren't trying to accurately polar align this scope, just get it close and make sure that a future accurate polar alignment of the LX200 was going to be possible. At this point I'd not bolted on the adjustment screws (no knowing where to bolt them until we'd had the scope of the system) so azimuth adjustment was via thumbing the wedge with a block of wood. The re-arrangement of the bolts on the alititude adjustment worked well enough. It was quite a fiddle of adjustment bolts, but ultimately the altitude adjustment was smooth and repeatable. Much easier for two persons. If the wedge is left permenantly mounted then it should n't need much adjustment in the future. I'm pleased to say everything worked out, and we were able to get a fairly good polar alignment, so much so that some simple imaging was possible with a Canon 350D. This particular camera has had the IR filter removed (and not replaced with anything) and is strictly an astro camera. Some nice frames of M57 and M29 and others were captured at the prime focus. Of course, long exposures are impossible at the image scale without guiding, however, we could enjoy some nice pictures from a series of stacked 10-20 second exposures. The cloud and haxe was a problem, but bright targets such as the ring nebula punched through the murk - I could even see the Ring Nebula M57 visually through something called an eyepiece. I'm also looking for some gold tin foil. I want to dress up Pete completely from head to toe in gold tin foil and put the LX200 on the floor next to him for a hilarious photo opertunity. Any idea how to arrange the suns of Tatooine in the background? !